The Meetings column shows your meetings for the next 5 days. Under each meeting title you can see the date and time, projects/tags associated with the meeting and the name of the meeting organizer. When you click the arrow button in front of the meeting title you can see the agenda. You can open a meeting by simply clicking on the meeting title. To edit the task and see more details, simply click on the task title. Under the task title you can see the owner, the due date, any tags associated with the task and if the task was created during a meeting, the meeting title. 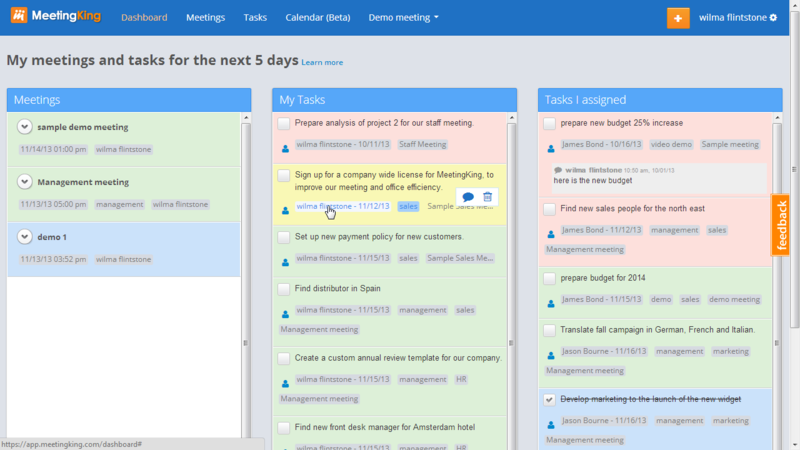 To quickly find the context of the task, you can click the meeting title to open the meeting. *If you don’t want to navigate away from the Dashboard, right click on the meeting title and open the meeting in a new tab or browser window. The logic for the tasks I assigned is the same as for My tasks, except of course that this column lists the tasks that others have to do for you. Often times we are pretty good at writing down our own tasks, but keeping track of what is owed by others leaves much to be desired. With MeetingKing nothing will fall through the cracks. To enable the Dashboard page go to: My Account > Preferences. !Note: the filter at the top of the page does not change the information in the Dashboard page. This page will always show all your meetings and tasks for the next 5 days.